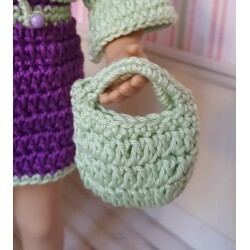 Crochet pattern for 32-34 cm doll such as Minouche, Little Darling, Mini Maru, Paola Reina or Chéries Corolle. You buy a pdf file with dress, bolero jacket, bag, shoes and beret pattern. Materials : violet and green cotton yarn (Philcoton 3 from Phildar), 1 small button to fasten the dress, 4 beads (2 for the shoes and 2 for the bolero jacket) a size 2.5 crochet hook and one size 2 (only for the shoes).